The Facebook IPO was something eagerly awaited the world over. Unfortunately for Mark Zuckerberg, the actuality was nowhere near as exciting as the anticipation. At least not the good kind of exciting. Facebook avoided going public for a long time, and while the excitement over its initial offering seemed high, the response was less than spectacular. Then, last Thursday, Facebook announced its first Quarterly Earnings report. Facebook headquarters in Menlo Park, Calif., is not a kibbutz. The employees that joined the company are like all the other creatures in Silicon Valley; they want to get rich. It’s hard to imagine morale at Facebook won’t take a hit that correlates with the loss in value of the shares belonging to the employees. And things don’t look promising for the stock short-term given that the employees, ex-employees, hedge fund managers, venture capitalists and Russian oligarchs that held pre-IPO Facebook stock will be freed from their post-IPO stock lock-ups starting in August. Make no mistake: the early institutional investors are heading for the exits. I must say, if I were holding a Facebook stock option, I would be planning on doing exactly that. The lesson of the Facebook fiasco for Silicon Valley is clear. Start-up entrepreneurs cannot evade the discipline of the capital markets any more than can the prime ministers of Spain and Italy. The markets have a way of focusing the mind. Zuckerberg & Co., might have not been so late to embrace mobile or might have had more urgency to develop a monetizing strategy had Facebook faced the trading hordes earlier. As New York hedge fund manager Dan Loeb recently demonstrated with his intervention at Yahoo!, Wall Street and Silicon Valley need each other. Zuckerberg thought shielding himself from guys like Loeb would help him build a better company, but that is not what tech entrepreneurs will take away from his example. As the stock price descends, Zuckerberg and Co. are rolling out as many ways to monetize as they can manage. (See my Sponsored Stories article for gory details on one questionable effort in this regard.) I wonder how long before they begin alienating large swathes of their user base by doing so — after all, Facebook has a long and tarnished history with these things. While in no way an actual study, I must note that I’ve observed more and more people in my own circles ditching Facebook completely or moving most of their interactions to Google+. Not a majority by far, but enough to denote a potential trend. “Facebook shares tumble to record low” — The Telegraph U.K.
What about you? 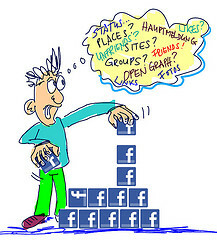 Have the Facebook IPO or its new marketing measures got you concerned? Have you already relocated to another platform? Why or why not? We would love to know! Image by stoneysteiner (Urs Steiner), used under its Creative Commons license.